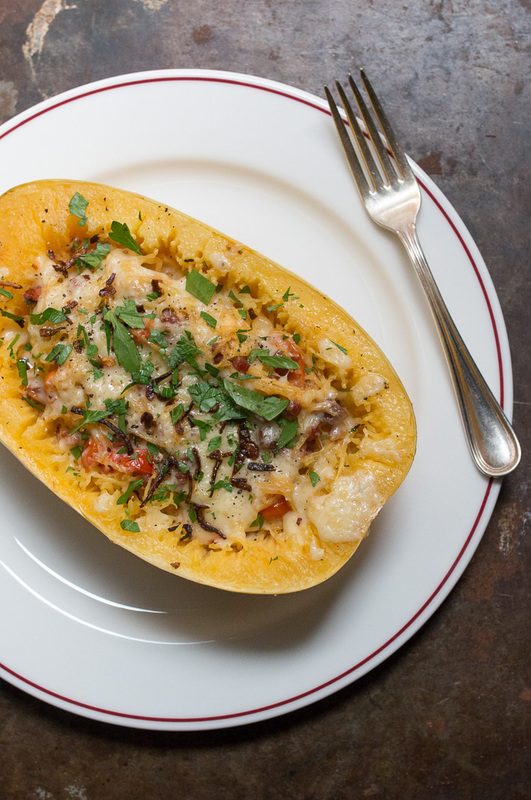 If you haven't yet cooked with spaghetti squash, you are really missing out on a truly versatile vegetable. 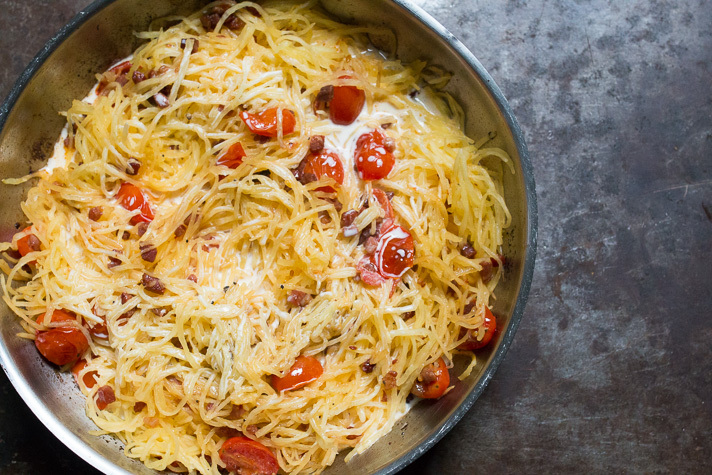 Yes — it looks and even resembles spaghetti but its unique characteristic is in how it takes on whatever flavors you might pair it with. This satisfying and filling dinner for two is a twist on spaghetti carbonara and can easily come together within about an hour. As an added bonus, when dinner is done you can literally throw away the dishes (aka squash bowls)! With that, let's get cooking! *For this recipe I fried the shallot in olive oil and used it as a crispy garnish on top. 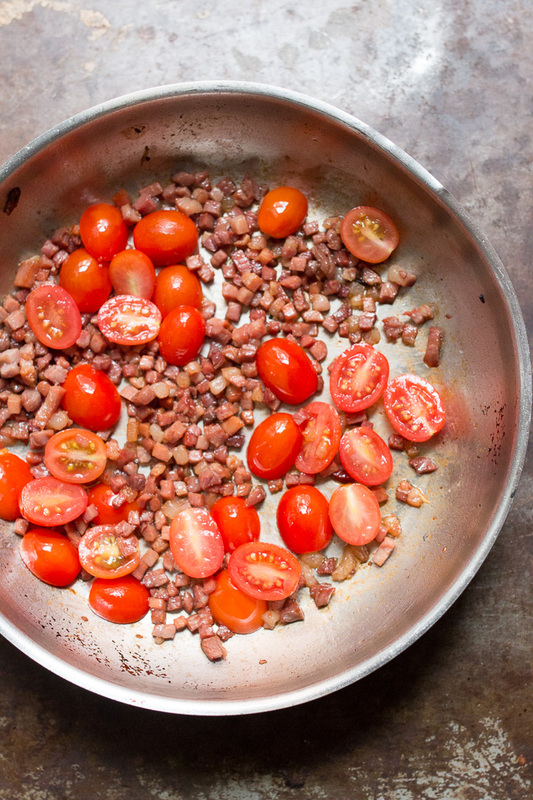 You can do the same or simply cook the shallot with the pancetta. 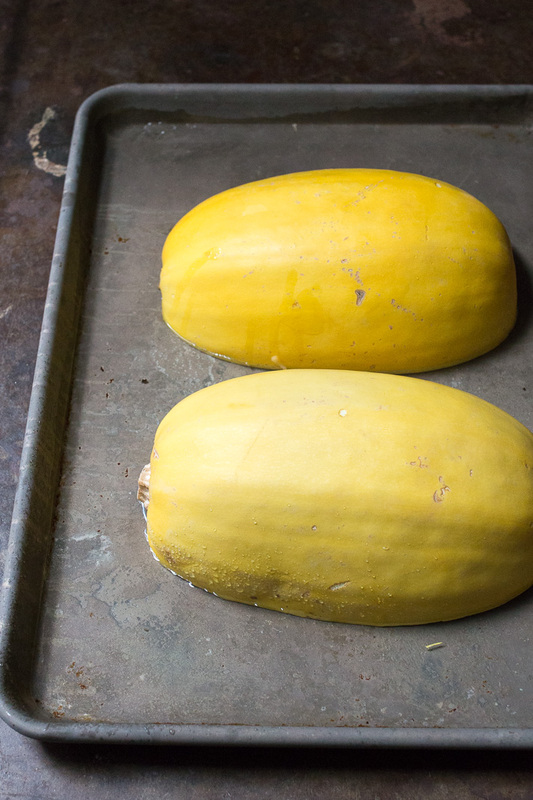 Begin by preheating your oven to 400° and slice the spaghetti squash in half. Remove the pulp and seeds; did you know seeds can also be saved and roasted? 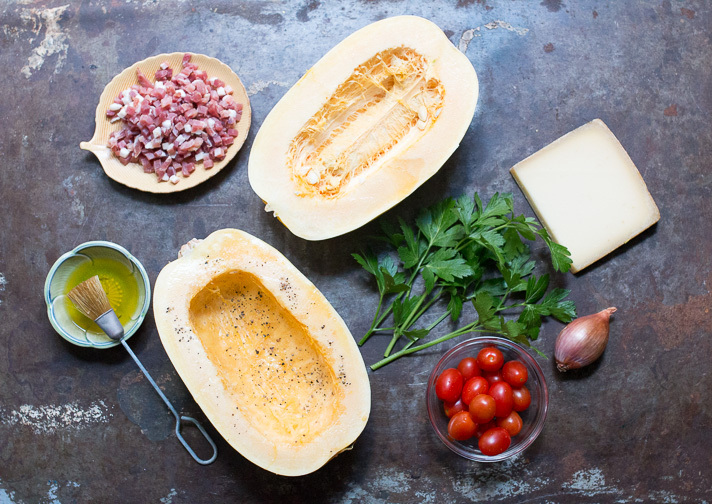 Brush the inside of the squash with olive oil, then sprinkle with salt and pepper. 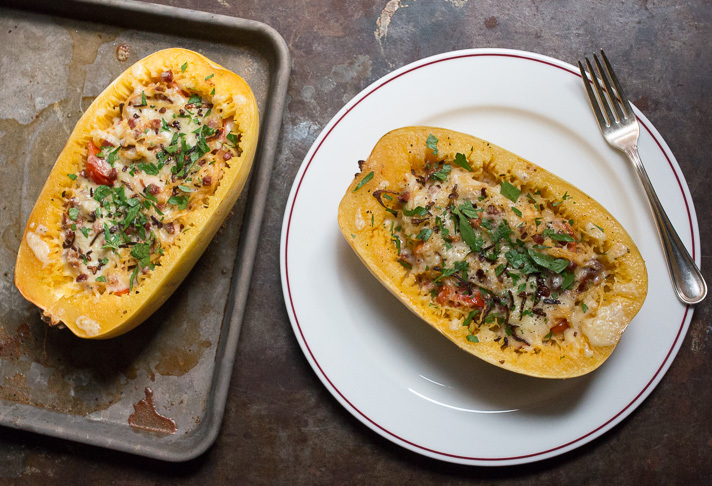 Lay the squash cut side down on a baking sheet. Add a little water just to cover the bottom of the pan and bake for 35-40 minutes. Doing so will help steam and soften the squash while it roasts. While the spaghetti squash roasts heat more olive oil in a pan over medium heat until shimmering. Add the pancetta (and shallot), cooking until browned, about 8 minutes. Add the tomato and stir occasionally until the tomatoes break down and become a little jammy, another 5-8 minutes. 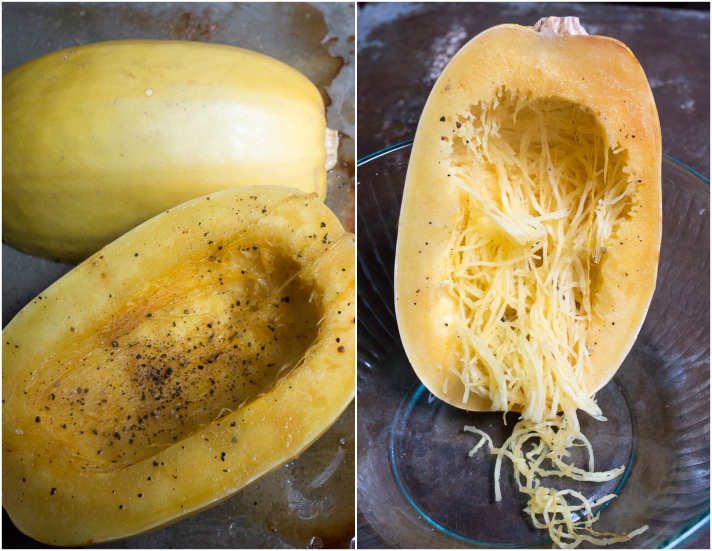 Once the squash is done roasting remove from the pan and rake the softened flesh with a fork into a bowl, reserving the shells. Add the squash to the pan with pancetta and tomatoes, then toss in a 1/4 cup of the Gruyere cheese and the heavy cream, stirring to combine everything together. 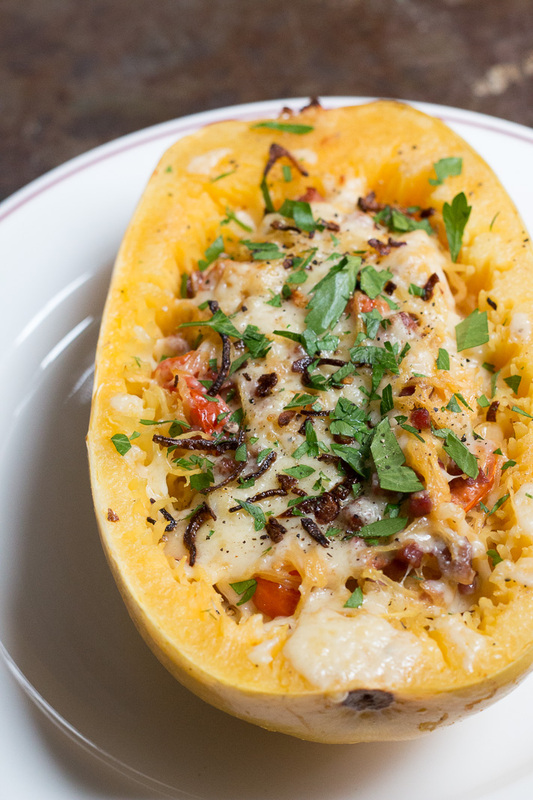 Scoop the carbonara mixture evenly back into the squash shells, coating the tops with the remaining Gruyere cheese. Return to the 400° degree oven and bake for 8-10 minutes or until the cheese is melted and bubbly. Remove from the oven and garnish with the fresh parsley and crispy shallots if that is the route you choose. Pair with a glass of sauvignon blanc and enjoy this comforting twist on spaghetti carbonara for two!